The past two weeks have been tough, for a lot of reasons. But a few interesting moments have popped up from time to time. After dark the other evening our dog, Misty, kept running to the fence and barking up a storm. There is a small dog next door that gets her teeth into the bottom of fence slats and pops them until they break. Since her owners fixed the broken slats, she has been less successful. But I assumed that it was the dog that had Misty barking. I heard something on – or messing with – the fence. When I stopped hearing the noise, I went back inside. Not too much later, Cyndy came in from the backyard, got a flashlight, and went back outside. When she had- been out there a while, I took the camera and went outside. 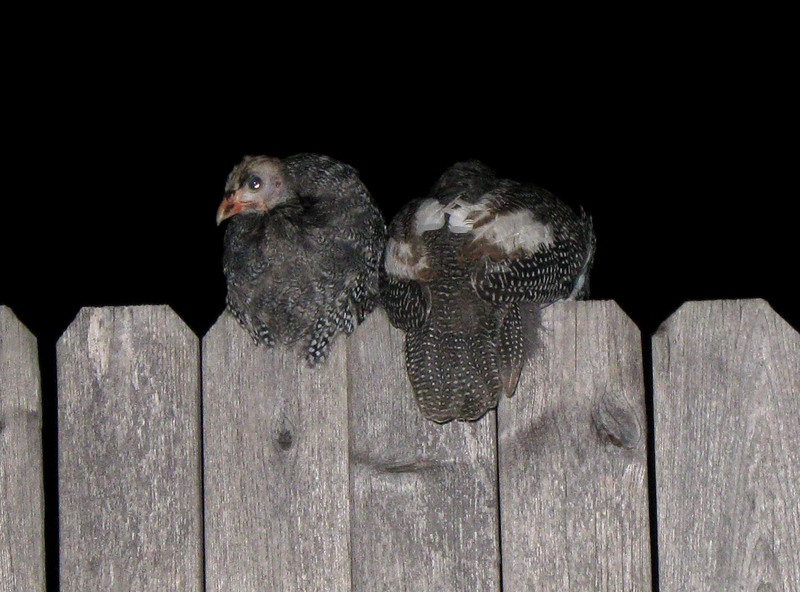 Sitting on the top of the fence were these two guinea hens. We were not sure at the time what they were. We knew the family had hens (one they found out later was a rooster), so hens were our first guess – just not guinea hens. Cyndy talked to the father the next day and he filled her in. But we do not know what is beneficial about having guinea hens nor do we have the inclination to spend time finding out. And it still might not explain why our neighbors have them and the father did not volunteer that information. As you can see, when they are in pairs they each face the opposite way. It was pitch black so I could not see what I was aiming the camera toward, even when Cyndy aimed the flashlight at them. I was afraid they would fly off the fence, which is what the other hens would do during the day when I make a sound – but I had not encountered the guinea hens before. But it did not seem to matter to them – particularly the one facing the camera. There does not seem to be a lot of thought going on behind the eyes. The flash did not seem to be at all bothersome. It is interesting living next door to a family with animals other than dogs or cats – they have another small dog besides the dog that tries to eat the fence, but he is just as noisy. Before they got rid of the rooster it was really annoying. The rooster did not know a porch light from the sun. But even the hens spend a good part of the morning clucking. I always enjoyed visiting farms, but I doubt now that I could live on one – at least a functioning animal farm. I would not be able stand the noise, not to mention the work when the noise meant I was behind with it. To re-phrase it, I might be able to live on a farm if someone else did the work. Not because I am adverse to hard work, but because working with animals is a whole nother, well, animal. Animals, particularly in suburban areas, are not always consistent. The hens do not cluck at the same time every day. The dogs in the neighborhood, including Misty, cannot be depended on to bark consistently at anything except someone in the alley or stopping at every front door for whatever reason. The inconsistency makes each day the same, but different. While I do not think I would be comfortable living on a farm, with all the violence and death in the world, it is somewhat comfortable and reassuring to hear the sounds of animals during the day. It reminds me that life goes on and God is still in charge. It would be nice to get some eggs once in a while, though.